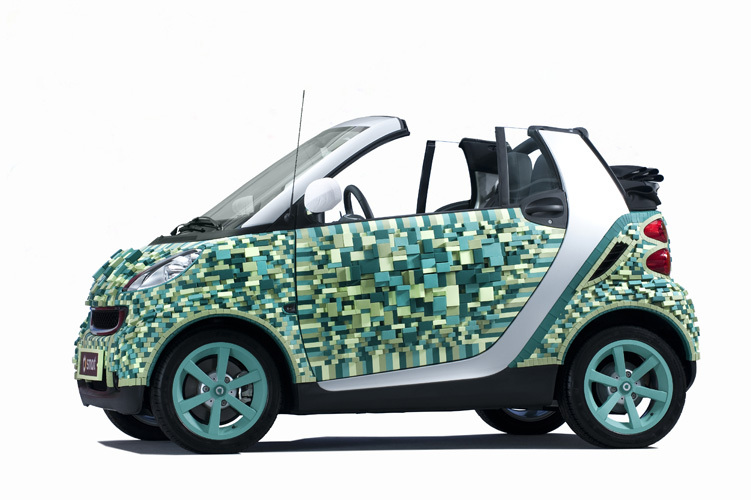 German artist Sarah Illenberger has reinvented the Smart ForTwo car by camouflaging the green machine in a beautiful mosaic of recyclable Gmund cardboard boxes. Illenberger selected various shades of green to create this pixelated form, and the German artist teamed up with Smart and packaging specialist Cartondruck to design the promotional piece of art. Although it pales in comparison to it’s relative the disco-ball studded Smart Electric Drive, Illenberger’s art piece offers us a new and strangely futuristic example of mobile artwork. The piece of “smart” art, was presented in Paris last fall by Marc Langenbrinck, Managing Director of the smart brand, who stated that the project sought to demonstrate that the cars are not ‘disposable’ and can make a lasting impression “even when constructed out of an unorthodox material”. 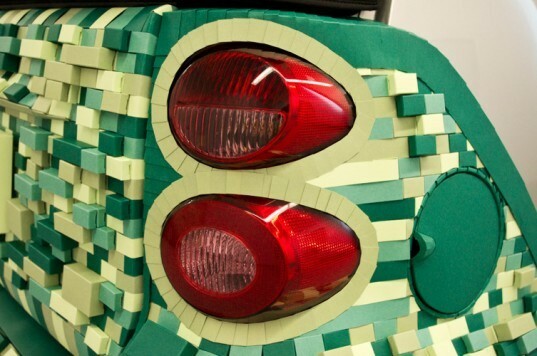 The piece intended to highlight urban creativity and the green credentials of smart cars, so it’s almost a shame the structure had to be cardboard clad – but the masterpiece may attract earn enough interest to persuade others that the mini motor is a green dream. Sarah Illenberger has reinvented the Smart ForTwo car, camouflaging the green machine in an attempt to reflect its sustainable objectives. Covered from hood to trunk in high-quality recyclable Gmund cardboard boxes. Illenberger selected various shades of green to create this pixelated form. The German artist teamed up with Smart and packaging specialist Cartondruck in designing this new promotional piece of art.